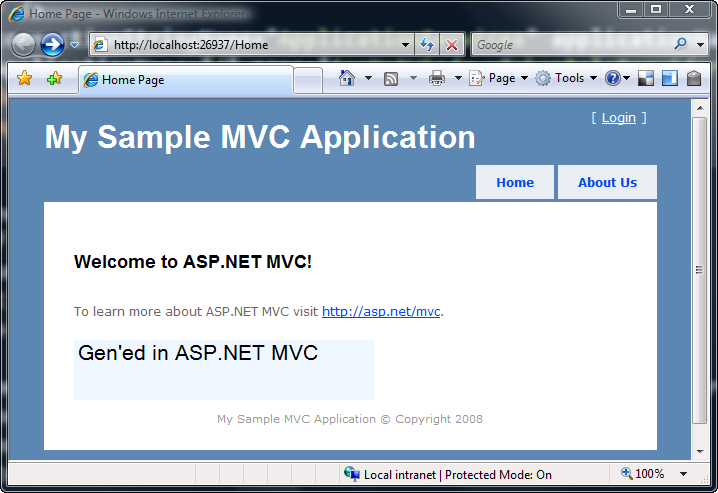 There's a treasure trove of interesting stuff over at http://www.codeplex.com/aspnet. It's a bunch of potential future stuff that the ASP.NET team is working on. That's where you can get builds of ASP.NET MVC, Dynamic Data Futures, and new AJAX stuff. Two days ago a new CodePlex release snuck up on the site. It's a potential new feature, so it could go nowhere, or we could make T-shirts and sing its praises. Could go either way. No promises. Justin Beck, an ASP.NET intern, prototyped and design it, then Marcin Dobosz, an ASP.NET Developer tidied it up nicely. Right now it's called ASP.NET Generated Image and you can get a release today. I've done a lot of HttpHandlers that generate images. It's usually pretty tedious. When I was working banking, I wrote an example HttpHandler that would take two Check Images (back and front) and composite them into a single image on the server side, then serving up the composite. Usually you're messing around in with MemoryStreams and Images, and then you serialize the result out to the Response.OutputStream, making sure the MIME Types are set appropriately. If you're really clever, you'll remember to do some client-side and appropriate caching, but I rarely see that in the wild. So what have Justin and Marcin done here? First, they've created a control with a little design mode "chrome" that makes getting started easier. The control is actually an extension of <asp:image/> that creates an HttpHandler and wires up the the src= attribute to the handler. If that were all, it'd be cute. However, second, and most importantly, they've created a base class that can do caching, transformations and parameter passing for you. It's really nicely factored, IMHO. All I need to do now is override GenerateImage. Any parameters to the control will be in the NameValueCollection. I just need to return a new ImageInfo, and the constructor for ImageInfo can take either an Image, a byte or an HttpStatusCode. Clever. ImageTransforms? Hm...you can also setup a collection of ImageTransform objects into a little mini-image processing pipeline to do whatever you like. Here we add a copyright watermark dynamically. The Transform is added in the constructor in this example. The source for the CustomTransform, and for all the samples and the preview assembly that makes it all work is up on CodePlex now. If you've got ideas, find bugs, or think it's cool, leave a comment here and I'll make sure they get them. You can also leave bugs in the Issue Tracker on CodePlex. Providing parameter type inference for the handler instead of a Name Value Collection. Giving you control of transforms, caching inside of your Generate Image Method. Does it work with ASP.NET MVC? Gee, I dunno. Let's see. Remember that if you're using ASP.NET MVC with the WebFormsViewEngine, as long as there's no Postback, some Server Controls can still work. This just might, as it renders on the first load. I added the ASHX handler file to my MVC project, referenced the DLL, made sure to register the tag prefix and it mostly worked. The design service isn't working, saying something about "could not be set on property ImageHandlerUrl," but I'm encourage I got this far. Let's encourage them to keep MVC in mind! Cool. Have at it at CodePlex. No warranty express or implied. You should dispose the IDisposable Graphic object in the example above. Since ImageInfo takes a bitmap in the constructor, I assume it takes ownership of the Bitmap object your created so I wouln't worry about that one, but Graphic certainly would need to be used with a using() statement AFAIK. Robert - True. It'll eventually get cleaned up, but you're correct, it's best to be tidy. Is someone going to let them know that technically, using GDI+ on a web server is not supported? I've done my fair share of GDI+ programming in our project, and I think I'm going to go for less than more. Although it is very cool to do, we have found many issues by doing it. Even though, we do caching and what have you, we have had problems with performance, issues with accessibility, and problems with our integrators... and all because a web designer thought it would be cool to use a non-standard font everywhere on our website. That's surprising. I've generated Charts and Graphs for banking for *years* and never had as much as a hiccup, even on incredibly large sites. This is literally the first time I've heard this. I did a blog post (with the source code) with pretty similar features, but it seems to be a pretty nice library. Basically a small class library to open images, do manipulations on them with parameters and then cache the result depending on all those parameters. This is something we all have to do at one point in ASP.NET, let's hope this project gets popular. Like Hanselman said above I've written dating sites and social networking sites that use plenty of GDI+ for scaling images for profiles and have never had a hiccup. The only issues I've ever had were not around GDI+ but instead trying to handle large uploads when people upload HUGE files, but that is another problem and a different discussion. Is this one of those things where it's probably OK to use GDI+ on a Web server but not officially supported because Microsoft hasn't thoroughly tested those scenarios? Does this new ASP.NET Dynamic Image Handler mean that Microsoft will now officially support using the GDI+ API's on Web servers? I suspect that most of those map to the native Win32 API's and graphics API's require large memory buffers which means memory will get pinned to perform native ops, which means that the garbage collector might have to do more work to collect these, which means that the garbage collector won't be able to collect these as quickly if you aren't fastidious about disposing your objects (*cough* Scott! *cough*), etc. Where are you guys seeing or hearing that it's not supported to do this kind of drawing? I'll ask around and get a boss to say otherwise. I've never given it a second thought. Does anyone remember the asp:DynamicImage control that was in ASP.NET 2.0 beta but got cancelled? Scott, could you ask around why it was cancelled, if it was because of time why it wasn't in ASP.NET 3.5? @Kevin: Holy crap, is that Yi Ar Kung Fu in your avatar? Brings back sweet, sweet memories. I was actually surprised to see this, since I also knew this was unsupported. Knowing this, what I do in my ASP.NET application is simply create the images beforehand in a process outside the hosting IIS process and save them in the database (being few and under 1KB, there's no real impact there). "Classes within the System.Drawing.Imaging namespace are not supported for use within a Windows or ASP.NET service. Attempting to use these classes from within one of these application types may produce unexpected problems, such as diminished service performance and run-time exceptions." @Scott - I left a similar comment to Omer, quoting the docs, but the comment system seems to have eaten it. Just FYI. I'm curious, what's the technical advantage of achieving this using http handlers rather than just using a .aspx page as the image source and injecting the response stream from there? Is it purely that the "webform" is a heavier base class? Ian - Yes, a page that generates an image is overkill. Remember that a Page *is* an HttpHandler, except it has a whole Page lifecycle, a bunch of events, the control tree and a whole pile of totally not related stuff. HttpHandlers for specialization will always be faster than making the Page dance. @Mike- Exactly! That's just the thought that came to my mind. This seems like a very similar control to what DynamicImage was supposed to become back in ASP.NET 2.0. That was one of the cut 2.0 features I was most sad to see not make it out of beta. That said, I'm happy to see the idea re-kindled. Hopefully this will find it's way in to ASP.NET "4.0." @ScottHu - (OK. No more Scotts allowed at Microsoft in DevDiv - with ScottGu, ScottHa, ScottGa and now I find there is a ScottHu. My mind is about to explode.) Back to the real issue at hand. Is there any timeline on when we'll start to see some of the early caching bits? We make heavy use of caching and caching providers in DotNetNuke and have already started investigation into a Velocity caching provider. It would be nice not to waste a bunch of effort if we might end up refactoring our caching infrastructure to use the .Net 4.0 providers. As for Dynamic images, Dino Esposito actually had an MSDN Article in 2004 that backported the Image Generation Service to Asp.Net 1.1. It would be interesting to see how this differs from the Futures work. Test post by Steve S.
When doing support at DD I found that if a user opened up an support issue with M$ and it took place in ASP.Net, that if they found a reference to System.Drawing.dll they would stop the support ticket since it was 'not supported'. It obviously does work though. Quoted "Classes within the System.Drawing namespace are not supported for use within a Windows or ASP.NET service. Attempting to use these classes from within one of these application types may produce unexpected problems, such as diminished service performance and run-time exceptions." the generated handler will be created using C#. I wrote a control that does image rendering and is "databindable", mostly because I got tired of rewriting the same code over and over again. It is posted on codplex for quite a while. It renders text, normal image or images from a database, but it does not handle caching. The source is at http://www.codeplex.com/dbic if someone is interested. OK stop the nonsense. Generated images in websites is just a must have. Microsoft do support them because they use them a lot themself. If we listen all the nonsense there, we should stop doing charts on websites, close map/traffic sites, and get back to static HTML 1.1 sites. Thx Scott, for the info, wasn't aware there is a wizard made by MS to shotcut the handler declaration.